All of us at UNE Colorado are energized by our new direction and renewed commitment to building a member-led. If you share our vision, please join us and become a member to build the people power we need to build a new economy. United for a New Economy (UNE) works towards its vision by building community power through organizing; community activism and innovative policy solutions. United for a New Economy (UNE) envisions vibrant, strong communities where ALL community members have a voice in the decisions that impact them, access to economic security; which includes affordable housing and good jobs and the ability to live free of racism and fear. Respect: We see a world where everyone is treated with respect and dignity. This means that no inequality, racism, patriarchy and any form of oppression. Everyone deserves to live without fear or violence. Equity: No one deserves to be left behind. We see our neighbors sharing their stories and holding big corporations, elected officials and decision makers accountable. We see a world where the system is balanced by meeting people where they are without judgement and dictation of rights and resources. Democracy & Human Rights: Our country is built on the principle that everyone has a right to stand up and fight. All of us should have thriving neighborhoods with affordable housing, good job, and a voice in building an economy that works for everyone. Collaboration: We believe that alone we cannot achieve our bold vision. It requires collaboration and partnership at all levels. We build and strengthen transformative strategic partnership and impactful solidarity for the long term. People Power: We see our neighbors who have everything to lose and still take the streets to rally for unity and dignity, because we see that our destinies are intertwined. In a time when so many families struggle just to make ends meet and face open racial discrimination, the movement needs to focus more on organizing and developing leaders to build grassroots people power we need to build a new economy that works for everyone. Thanks to Partnership affiliate FRESC’s leadership in the fight against wage theft, the Wage Protection Act (SB 5) passed out of the Colorado legislature yesterday and is headed to Governor Hickenlooper’s desk for signature! In February, FRESC: Good Jobs, Strong Communities and the Colorado Building and Construction Trades Council hosted a day-long training designed to deepen relationships between construction trades unions and their community partners. Together, the Partnership for Working Families is building the next generation of leaders in our cities, leading change from the ground up. That is exactly what is taking place in Denver. You can see the power our movement has built in the recent results of the Denver municipal elections. FRESC and our allies will have four champions on City Council. Last month, Denver voters elected FRESC Program Director and Staff Attorney Robin Kniech as City Councilwoman At- Large, making her the first out LGBT elected official to serve in city government. 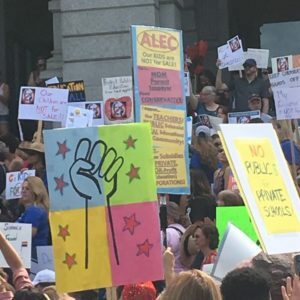 On June 7th, in a run-off election District 1 voters elected Susan Shepherd, former Denver Area Labor Federation Political Director, to represent them. They both join former FRESC Executive Director and current City Council President Chris Nevitt and former union organizer Paul Lopez on Council. With these champions and several other allies on Council, we anticipate a majority on our 13 seat City Council. In addition, Mayor-elect Michael Hancock attended FRESC’s candidate forum and signed our pledge to prioritize good jobs and strong communities if elected mayor. We seek an experienced organizer and manager with political campaign experience to become Managing Director of a new dynamic 501(c)4 sister organization to FRESC. The new Managing Director will report to the Executive Director of FRESC and will receive intensive and regular support and training from both FRESC and staff at the Center for Popular Democracy.